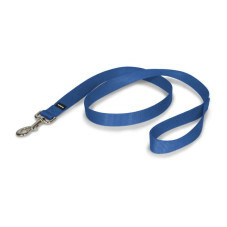 How do I fit a dog with the Gentle Leader Headcollar? When fitted properly and viewed from the side the Gentle Leader will be in the shape of “V” for “Victory.” If the neck strap is too loose, the Gentle Leader will incorrectly resemble a “L” for “Loser”. Neck Strap fit – The neck strap must be positioned as high on the neck as possible, directly behind the ears and touching the base of the skull in back and above the Adam’s apple in front. It should fit very snugly at the top of the neck so that one can barely get a single finger underneath, like a watchband. It doesn’t cause discomfort to the dog. Nose Loop Strap fit – Loose and comfortable so that the dog can freely open his/her mouth, but not so loose that it can be pulled off over the nose. It should rest close to the dog’s eyes and behind the corners of the mouth. How do I make sure I have the right size? Consider your dog's weight based on the chart below. Next, look at the shape of the dog’s head and snout. Breeds with long slender heads may take a smaller size than other dogs of the same weight. Breeds with wide muzzles may need a slightly larger size. When in doubt, choose the next larger size. How does a Gentle Leader Headcollar work? The principle behind the Gentle Leader Headcollar is one that allows owners to communicate with their pet in a way that dogs instinctively understand. The nose loop encircles the dog’s muzzle and applies light pressure in the same manner in which the lead dogs naturally communicate with dogs lower in rank. Because of the placement of the nose loop, the dog immediately understands his/her place in the hierarchy. The dog considers the owner his/her leader. What are the advantages of a Gentle Leader Headcollar? Stops pulling on the leash. With the Gentle Leader Headcollar, you steer the dog’s nose and the body will follow. It’s virtually impossible for a dog to drag his handler down the street when his head is turned. Control. With the Gentle Leader, you only have to compete with the strength of a dog’s neck and head not all of the power packed in the body. 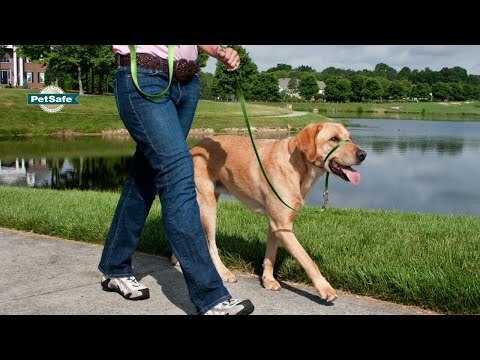 This makes it easy for anyone to walk big or strong dogs. Safety. Unlike the choke chain or prong collars, the Gentle Leader Headcollar is safe to use on puppies as young as 8 weeks old. There is very little pressure applied to the dog’s muzzle and no pressure on the throat. Comfort. The Headcollar eliminates uncomfortable pressure on the throat when pulling on a standard collar. The Gentle Leader Headcollar is a positive, no-pain option for controlling a dog. What does the Headcollar look like? The collar has two soft nylon straps – the neck strap portion fits high and snugly at the back of the neck above the windpipe and the other portion loops loosely around the nose behind the corners of the mouth. When fitted properly, a dog is free to open his/her mouth to eat, drink, pant, fetch and bark – except when one closes his/her mouth by gently applying pressure to the leash. The Gentle Leader Headcollar is a great training tool for dogs who pull on the leash. Watch our tips for fitting the headcollar, getting your dog used to wearing it, and teaching your dog to heel.